A shopper’s paradise and a foodie’s number one destination, Durbar Marg also plays host to thrill seekers looking for a late night out. 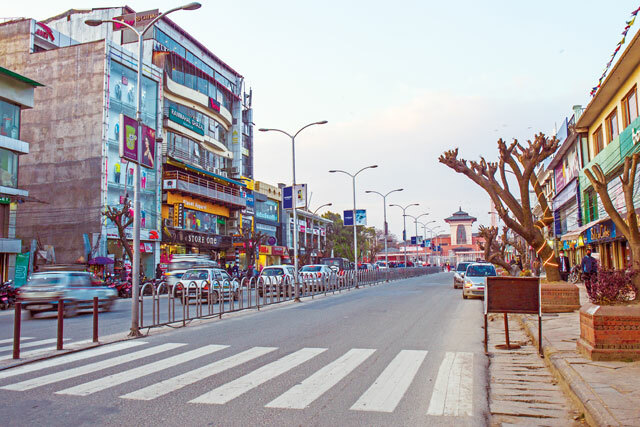 Durbar Marg, also known as Kings’ Way, is the heart of Kathmandu. Considered one of the posh areas of the capital city, it is known for once being home to royalty. 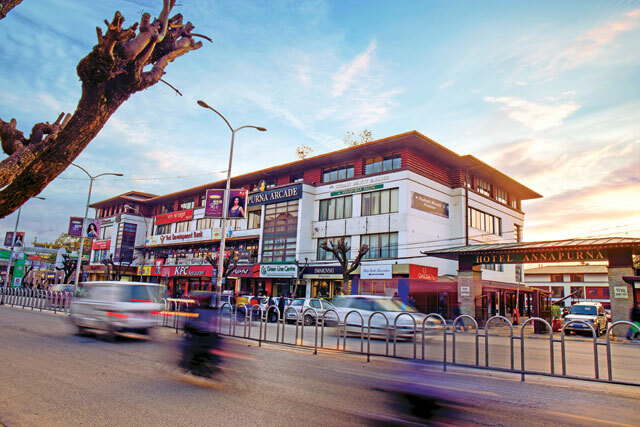 In recent times it has grown and diversified to include top notch boutiques, branded shops, malls, designer clothing stores and high end eateries, attracting fashionable youths and fostering a vibrant nightlife. This is a street where one can purchase luxurious goods ranging from clothes and watches to perfumes, jewelry and more. Shopping around Durbar Marg is not just a buying process but an experience both pleasant and immensely satisfying. Besides buying branded wear, tourists can hunt for souvenirs and exquisite local handicrafts to take back home. Remarkable statuettes of gods and goddesses along with art by local artists fill up the souvenir stores along the sidewalks. Those looking for beautifully designed jewelry will not be disappointed either as jewelry stores have also set up shop here. 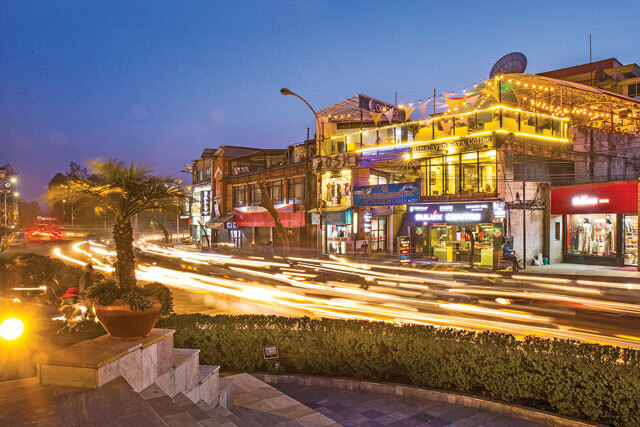 The charm and exuberance of Durbar Marg lures thousands of locals and tourists each day bringing much needed business to an area where overheads are high. On the streets, one comes across an array of world renowned fashion brands from Zara, John Players to Adidas and many, many more. Endless possibilities of options are the foundation to Durbar Marg shopping. You can shop till you drop as the saying goes and you could quite easily find your wallet empty by the time you get near the Narayanhiti Palace at the end of the street. The palace has been turned into a museum after it was vacated by the Royal family and is worth a visit. The area is becoming a hub for passionate designers and boutiques that make bold fashion statements. Durbar Marg gives you a glimpse of western high end fashion choices, simple street fashion and a cultural mix of ethnic fashion, with a wide range of traditional wear. The general crowd on the street has good fashion sense and it shows in the way they dress. A cultural mix of designs is seen with the designers bringing their ethnic Nepali touch to western style clothing. The Nepali fashion industry is rising to its full glory and this is visible in what people wear today. Stores like Zara might sell international designer clothes but boutiques like Chiffon and RD Chaahat Boutique showcase a wide range of dazzling traditional wear from sarees to lehangas with a wonderful blend of western fashion. A balance between the two worlds brings out the best of what fashion has to offer. Durbar Marg is a place where designers bring fresh ideas to the table for the rest of the city to see and cherish. 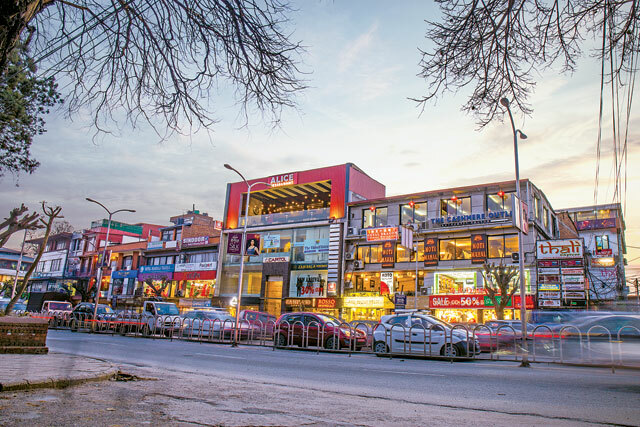 Fashion, shopping and food are highlighted in the famous Sherpa Mall (formerly a hotel) that transformed Durbar Marg when it was re-opened as a shopping mall in 2007. It is popular with tourists as well as locals and draws a large section of the elite crowd of Kathmandu. It has become a destination for ultimate luxury shopping. The mall offers a mixture of high end shopping and fine dining experience. Branded goods ranging from clothes, bags, footwear, accessories to perfumes are all available in the numerous stores within the mall. A number of luxurious eateries await shoppers who need to quench their thirst or want to take a break for lunch/dinner before winding up their shopping. But they are equally great for just hanging out to enjoy the wonderful ambience. The upper floors of the mall provide a wonderful view of the street below and a once forbidden bird’s eye view of the Narayanhiti Palace. The entrance to the mall is filled with the irresistible aroma of food and freshly brewed coffee which draws customers towards the mall like bees to a flower. Famous for multinational cuisine, the eateries here provide a sensational experience to one’s palette. Not just a shopper’s paradise, Durbar Marg is also a haven for foodies. Besides the eateries mentioned above, there are more than a dozen other restaurants and cafes offering an amazing variety of cuisines from across the globe as well as a typical Nepali meal of dal-bhat. From family restaurants, pubs to fine dining depending on your preference, one can experience it all right here. From international food chains like KFC and Pizza Hut, to cafes like the Coffee Shop, Hotel Annuparna, Bakes and Cakes to Mezze by Roadhouse which incidentally offers a remarkable view of the palace nearby, there are innumerable choices. Chinese, Indian and Continental restaurants are found all over Durbar Marg to meet everyone’s preferences. Durbar Marg is also home to two five star hotels that are among the oldest in Kathmandu. Those looking for luxury and fine dining should definitely check into one of these hotels. Hotel Yak and Yeti and Hotel Annapurna are among the finest luxury hotels in the city. Yak and Yeti was built fusing modern designs with the existing architectural designs of the past. Hotel Annapurna is just minutes away from the old palace and retains its own luxurious charm. To experience Durbar Marg in its full glory one should visit after sundown, when the lights come on. The pubs, bars, night clubs and lounges stay open till late and attract both tourists and locals while various parties are organized to cater to the needs of those looking for more than wining and dining. Exuberant night owls start flooding the clubs once the sun goes down and booming dance music kicks in. One can enjoy delicious food, exotic drinks and expertly crafted cocktails while dancing the night away to hip Nepali songs and raunchy Bollywood and Hollywood hits. Whether one prefers dancing through the night or just sitting at the bar sipping cocktails, all are welcome. These clubs have amazing ambience with wild, thumping music and the best DJs in town to liven up the party until the wee hours of the morning. From a superb shopping mall to rows of branded goods stores, five star hotels and a remarkable choice of eateries, Durbar Marg has it all. Whether it is the Narayanhiti Palace Museum you want to visit, shop for designer wear, try out some delectable international cuisine or just hang out in the area sipping aromatic coffee, there is never a dull moment. Durbar Marg has something for everyone and the large crowds milling around every day say it all.